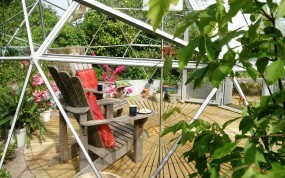 A Solardome® glasshouse is ideal for a wide range of outdoor living and recreational uses. They can be used, for example, to entertain in and eat alfresco all year round, host evening receptions, or cover a plunge pool or hot tub. 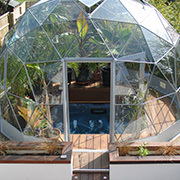 They also create a unique growing environment, allowing you to step into another world, such as a Mediterranean paradise, or tropical palm house to relax in. A range of dome sizes are available and advice is on hand to help you choose one to suit your needs. 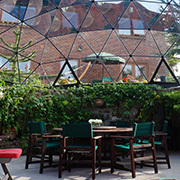 If you need more space, it is also possible to link or merge domes together to create the ultimate living space. 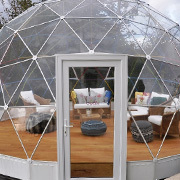 Contemporary design ,strong, wind-proof, and more – watch the video below to see the benefits a geodesic dome brings. So much more than just a greenhouse, our range of glasshouses are available from 3.6m up to 10m diameter, prices start from just £7,680 (inc VAT). Whatever your outdoor living ambition we can make your design vision become a reality. 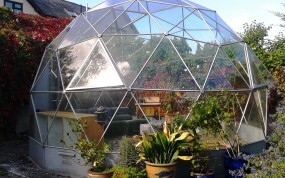 Mr & Mrs Jones became interested in having a geodesic dome greenhouse, but at the time the smallest dome was too large for their compact garden. 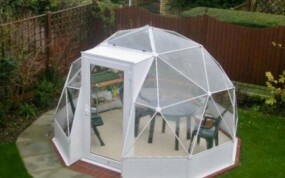 Then the SOLARDOME® POD was launched; which was the perfect size.